My garden in July, 2008. Taken from my own garden, open daily from the 1st weekend in April. I'm using this photo for the cover of a garden design and build book I've written available as a PDF download through one of my web sites - see my profile. I really like the deep rich colors. This is great ! Marvellous mixture of colours. The lupins are so unusual. The South West region of England is renowned for its 'large parkland gardens' with their magnificent displays of hydrangea, camellia and rhododendron. But once May is out they contain surprisingly little colour for the summer visitor. So from the outset I designed and created a true 'summer garden'. The comments from visitors and people like yourselves have continued to convince me it was the right choice and it's very much appreciated - thank you. My garden also happens to contain the most ornate, most innovative restored Victorian greenhouses in the whole of the South West region - bar none - I've often been told that! It's just a pity the BBC has a problem with getting film crews beyond the M25. "We don't do unfinished gardens', or so I've been told. . . . . Yet as every real gardener knows - watching a garden develop over time provides continuous interest for the visitor. That will just have to be the BBC's lose. We here can enjoy it and it is truly FINE!!! This is an inspiration for me. Thank you for adding this stunning pic. It looks like something Thomas Kinkade would paint. Stunning picture, Muddywellies, the lighting is beautiful, it reminds me of Alice in Wonderlands' garden, everything looks so happy in it, could do with a mooch round there today! Tis just a bit far from us, and many thanks for the advice on the Wisteria, I shall leave it till November. What a delightful path to meander down!!! It is absolutley beaaaaatiful!! !Good job!!! So often I've heard people complain that there is not much interest or colour left in gardens by late summer/autumn. How wrong they are! Many thanks to everyone who liked this, your obvious enthusiasm is a real pick-me-up and encourages me to do even more! I took this shot soon after a spell of the 'wet stuff' came down, which probably accounts for the hazy look. At the time, I was fearful of losing the shot due to the ensuing rain damaging the flowers. (The heavy rain did for the burgundy lupin in the centre as it turned out). The original brief I gave myself here was to create a rich border up to 60ft DEEP - (so often borders are measured by their length). This border had to provide interest throughout the year. In the winter months its more shades of green, texture and shapes. But from May right through to November it had to 'turn on the juice' with an ever-increasing crescendo of colour that would draw the visitor ever onwards to both 'mesmerise and absorb' from whichever direction they travelled or looked. I don't think it's 'there' just yet, but it's getting close, and I do get enormous pleasure from watching visitors trying to take it all in! There are still young plants here which are just too immature to create much impact for now. For example, there's a very young Mexican fire bush on the right. Also on the right but out of picture, are masses of different mature gingers (hedychiums) upto 7ft high which are only now waiting to deliver their magnificent blooms at the end of the month. (They're being delayed a bit this summer). But I don't think this is the best part of the border - that's just up from this photo and around the corner to the right by the fountain! Well, where's the photo of that then, now we're all dying to see it! It looks fabulous right now Janey, but it doesn't come out so well in a photo just yetThere are a great many excellent gardens in Cornwall and here in Devon which contain wonderful collections of hydrangea, camellia and rhododendron. These spring and woodland gardens are at their best during April and May. But when I set out to design and create Winsford Walled Gardens I wanted to create a garden that came in to its own AFTER May, a garden that would continue its best right through the summer and up until November. The gardens started from nothing after the JCB excavator left following 5 days of clearing the brambles and ivy. It's taken a while for me to create this garden and for the plants to mature to what they are today before I was confident enough to market it with pictures like this. We're open daily to visitors who can wander the gardens and enter the most ornate and the most innovative Victorian Greenhouses in the south west - bar none. (You can see how I restored them with my family's help on my web site). I'm always available in the gardens and happy to discuss with visitors their own gardens and my own. Brilliant! Has no-one told the BBC, however, that there is no such thing as a "finished" garden? Will you photograph the gingers when they're in bloom please MW? Will do Janey - if ever the rain stops! It is a stunning photo MW, be great for the cover of a gardening book??!!! Beautiful.Sigh. It's SO nice to see such rich, summery colours. I wish you all the best, Muddywellies. As I live in the South-West too, I hope you don't mind if I add you to my favourites as I would love to keep up with your work in your garden. Fantastic garden and photo!! It should be on the cover of a gardening magazine! absolutely stunning - and I thought I was doing well !! What a treat for the eyes, I'm sure that many more would appreciate what a masterpiece if only the BBc would get involved, what a shame so many more will miss it's beauty. Well done Muddywellies. Lovely colour and planting combinations. I just planted Lupins this year. I love them. Beautiful pic. Pretty as a picture. Nicely done. 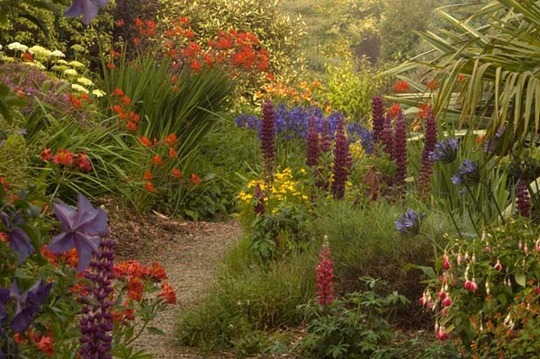 This is a gorgeous garden and photograph :) I'll have to check out your site. Beautiful Colors. looks wild and lush. just the effect I am trying to achieve. Stunning! How I would love my garden to look.